Dolph Gotelli is a professor emeritus of design at the University of California, Davis. 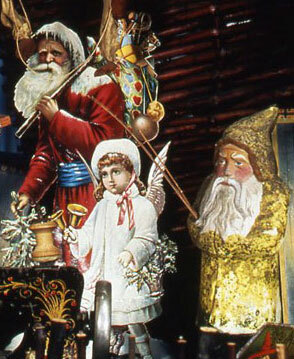 Gotelli is well known in the Christmas community for his elaborate exhibits and seasonal displays, which feature items from his collections of ephemera, Santa Clauses, and Christmas-related toys. Recently, we spoke with Gotelli about Christmas in the Victorian era, which is his specialty and chief passion. A member of the Golden Glow of Christmas Past, Gotelli can be contacted via his website, DolphGotelli.com. I grew up in a home without any antiques. As a small kid, I started decorating my parents’ home for Christmas. I don’t know what influenced me, perhaps being alone and living in a rural environment might have had something to do with it because I engaged in a lot of fantasy play. I made a lot of ornaments out of stuff that I had lying around, and I decorated using things that I found in the garden. Through the years, I became more interested in Christmas decorations and met a few collectors, but my interest really took off when I was attending San Francisco State University. The major stores in the city had incredible glass ornaments. One store that really went all out was Podesta Baldocchi in downtown San Francisco. It’s one of the city’s oldest and most famous florists. They would create their Christmas displays just before Thanksgiving—people would stand in long lines to get into the store just to see them. Podesta Baldocchi would fill its store with fresh, 14-foot silver-tip trees, maybe 20 of them, and each tree would be decorated in a special theme with its own ornaments. Craftspeople would work all year to make ornaments just for them. Glass ornaments came from Italy; some were made by local craftspeople. I had a friend who made some special sequin ornaments every year for the store. The Emporium used to import wonderful glass ornaments, and that’s really how I got started. As I traveled, I got even more involved. At some point I joined Golden Glow of Christmas Past, and the rest is history. I’ve been collecting ever since. I started designing exhibits with my collections, and in 1977 I organized what I think was probably the first major exhibition in the country on Santa Claus. The show was at the Crocker Art Museum. I received a grant to travel the United States to research Santa collections from major museums, including the Smithsonian, the Henry du Pont Museum, and the Margaret Woodbury Strong Museum. We published a little catalog, which is still being sold. The exhibition had 800-plus Santa Clauses. I traced the origins of Santa Claus, starting with Saint Nicholas and working my way through how he came to America and all his different aspects. I think that had something to do with the mania that happened afterward. It got national coverage—I would go back to the East Coast and I’d see people with my little catalog. All of a sudden, everyone was more interested in Santa Claus because I showed every type—from 1880s Germany to occupied Japan, right up to the 1970s. We also had a section of work by contemporary artists like Bob Arneson and Joan Brown, who I invited to do a Santa Claus art piece. It was a wonderful show. My main focus now is paper. I think I have a world-class collection of ephemera based on imagery of early Santa Clauses and early celebrations of Christmas from late 1850s and 1860s. I cut off at about 1919—I don’t really collect from the 1920s or ’30s onwards. That’s just too new for me. I started buying antique toys and dolls and other related childhood things, which I would use in displays and installations. I did a lot of work for Macy’s in San Francisco. I’ve done a lot of museum installations with Victorian trees and toys and all that. And I do a lot of lecturing on the subject. This year  I am creating an exhibit in the town of Folsom for their history museum. Collectors Weekly: Do your current displays focus on your ephemera items? Gotelli: No. The title of this year’s show is An Enchanted Christmas. I designed shadowboxes that are installed into a wall, like the mini-windows that you might have seen at the turn of the century. They’re filled with scenes of my antique toys and dolls in little settings. There’s a Christmas kitchen with animals preparing Christmas dinner. There are old Santa Clauses. So I take my objects and arrange them to tell little stories. It’s very popular. I did a display at the Crocker in 2001 called “Compliments of the Season: A Victorian Christmas.” That was a phrase used in the Victorian period for Merry Christmas. They didn’t say “Merry Christmas” as we do today. And that’s what the show was about. It was all Victorian pieces, a huge show in three galleries. Again, I created display cases where I showed activities from the Victorian period, such as women sitting in a parlor and working on scrapbooks. My main focus and interest is how people celebrated Christmas during the Victorian period, because that was the time when Christmas really excelled. That was the real renaissance. Collectors Weekly: Can you tell us a little bit about the spirit of the Victorian Christmas? An antique Christmas board game. Image source: Golden Glow of Christmas Past. Gotelli: Prior to that period, children were expected to be quiet in their homes, but as the impending visit of Father Christmas became more and more important, children became more involved in the events leading up to the holiday. Games started to appear during the latter part of the period, as well as Christmas-themed gifts for children. Children’s books had Christmas covers. There may have been standard fairy tales inside, but the cover would have a Santa Claus on it and a title like Santa’s Book or Santa’s Fantasy Christmas Voyage. Some had stories that were specifically about Santa Claus. Puzzles were Christmas-themed, and big block Santa Claus puzzles made of paper were very prevalent. They were printed on wooden square blocks. Board games in which you would move little icons were also very popular. 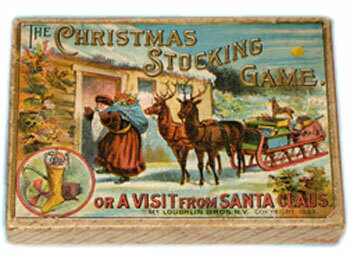 There were many different Santa Claus-themed board games, as well as wall games. I have a game called Santa Claus Party from the time when children had Christmas parties for their friends. These were very elaborate gatherings where the children would play party games themed around Santa Claus, like the one in which blindfolded children would try to put a pipe into Santa’s mouth. It was like pin the tail on the donkey, basically. Jack-in-the-boxes, or “surprise boxes,” were popular toys of the period, so there were Santa Clauses that would pop out of boxes. The boxes had Santa Claus imagery on them and were made out of celluloid or other materials. Pyrography, which is a wood-burning technique, was another big thing. You would give or get your gifts, and sometimes there’d be Santa Clauses burned onto the outsides of the boxes. Food was a really important element, as was the experience of sitting at the Christmas table with the Christmas poppers or crackers, as they’re called in England. People would pull on them and they would pop. Inside would be a hat and some little tokens. Then there was twelfth night, when the family would enjoy a special cake with a Christmas fairy on it. Little tokens were baked into the cake, so if your Aunt Lucy was a spinster and she got a wedding ring in her slice, maybe she’d get married. In Victorian times, Saint Nicholas was often portrayed as a tall and thin man. The gathering of the greens was another important event of the Victorian period. People would go out to the countryside and cut fresh greenery. This was done last-minute and the greenery wasn’t put up until Christmas Eve, not the day after Halloween like it is now. There were all kinds of rituals and stories about how certain types of greenery brought good luck, et cetera. 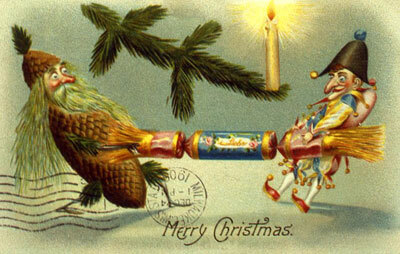 The Victorian period was a time when a lot of our Christmas customs were formalized. We still take a lot of our influences from that period, but much of the Victorian view of Christmas has disappeared. Even Santa Claus has disappeared to an extent. For example, children today have an entirely different image of what Santa looks like. 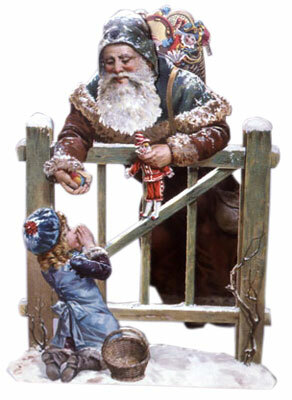 In Victorian times, the Saint Nicholas figure was tall and thin. Our children today who see these antique objects don’t even know that he is the original Santa Claus. I’m trying to keep Santa Claus alive. That’s one of my goals. I think that a lot of stories have dismissed him. I know a lot of collectors who are very upset that the word “Christmas” has disappeared. “Holiday” is not the same. It’s not a holiday tree; it’s a Christmas tree. This goes back to tradition. It’s not just religious, even though there is a religious component to it and the basis does go back to a Christian origin. It’s still a Christmas tree. That’s one of my pet peeves. Last year, I noticed that Macy’s started using “Christmas” again, which I thought was really good. For a while it was politically incorrect to use that word. Of course, the Christmas tree has evolved, too. That’s another area entirely. I have a great deal of early photographs showing original trees, and they were very different from the ones today. The Victorians put their gifts on the tree, but it wasn’t a plethora of gifts. Each child would get one or two gifts at the most, and Mother and Father would have a gift. And they would hang these on the tree, unless it was something large. That’s what I do in my displays. I’ve been very influenced by all my research, so when I do trees, I always put dolls on them, as well as all the other things that would have been hung. It’s not just a tree of ribbons like today. The trees were literally decorated. Collectors Weekly: Besides actual presents on the tree, there were still ornaments, right? Gotelli: Yes, of course. Glass ornaments and glass lanterns were used. Candles were used, but they were only lit on Christmas Eve and maybe on Christmas Day. All the wonderful glass lanterns were invented during this period. You would put a candle inside of them, and that was better than just having the candles dripping on the tree, even though they did have open candleholders as well. Most collectors have both. Some candleholders were made of metal with printed images of Santa Claus and angels to hold the candles. Oftentimes families would place a bucket of water near the tree because there were a lot of fires. A lot of paper was used on the trees. If the ornaments weren’t glass, they were made out of paper. Of course, if a candle hit a piece of paper, it was a disaster, so glass ornaments became popular. If the family was wealthy they would buy pressed cardboard ornaments, the Dresdens, which are highly sought after today. That’s probably the most sought-after ornament in the world of Christmas collecting. They’ve gotten very pricey because they were made out of cardboard—children played with them and then they were thrown away, which is why they are so scarce. Collectors Weekly: Was Christmas always focused on children or did that come about during the Victorian era? Gotelli: No. It has always been about children. Dickens wrote that Christmas was a time for children and when everyone can be a child. It was always a family holiday, but there was more focus on children during the Victorian period. People spent more time with their children. We’re talking about different classes. The wealthy homes, of course, had nannies or someone who would look after the children. Collectors Weekly: Are Victorian traditions practiced all over the world? Dolph Gotelli’s collection of Victorian Christmas ephemera includes countless early, and varied, depictions of Santa Claus. Gotelli: I travel a great deal and if I haven’t been to a certain spot, I always ask people what the traditions are like there. It’s interesting to see. The Christmas tree is becoming more important in Europe—it never had been before. A friend of mine who travels to Italy frequently said that they put up Christmas trees, and the Japanese do as well. I went to Japan many years ago, and they had huge Santa Clauses on the facades of their department stores in October. Every store in Singapore is as decorated as a department store in New York City. Asian countries really pick up on Christmas. They don’t celebrate for the same reasons, but it is part of their environment now. I have a big collection of international Santa Clauses that were done in obscure countries that have their own versions of Santa. A lot of them were made for export, but they still display them in their own country. Of course, movies have had a huge influence, but a negative one. People see what I call the “bad images.” Santa movies make me crazy. They don’t have anything to do with the real Christmas idea. Usually, the Santa Clauses are very mean-spirited, which is something that I don’t condone. That’s what the average child sees today. That’s all they see. They see all these movies at home on their screens, and that’s all they have to go by. The Night Before Christmas is probably not read much anymore. That was very traditional. As a child in the late 1940s, you always had someone who read you that poem. It was important. I don’t know why that hasn’t stuck around. I’d like to find out how many people even have that book anymore. I know it’s still around and you can buy it, but I just wonder how many parents actually read it to their children. Collectors Weekly: During the Victorian era, who made Christmas items? Gotelli: England had a small Christmas industry, but most items were made in Germany. That’s why the German stuff is the most sought after. The Germans really started the tradition. They got into Christmas more than anyone else. They had cottage industries, especially in East Germany. This was the only work that they would do. They would make wooden ornaments and toys to hang on the tree. The glassblowing started in East Germany and is centered around the village of Lauscha. They worked all year on Christmas ornaments. Women would sit at home and do detail work on Dresden ornaments. Everything was handcrafted. Woolworth was the first U.S. retailer to get really smart and import glass ornaments from Germany. German glass ornaments were first sold in America at Woolworth five-and-dime stores. So it started in Germany. Now, just about all contemporary Christmas items are made in China, although there is a small group of American artists who are still producing handmade ornaments. Collectors Weekly: Can you tell us a little bit about the ephemera items you’ve collected? 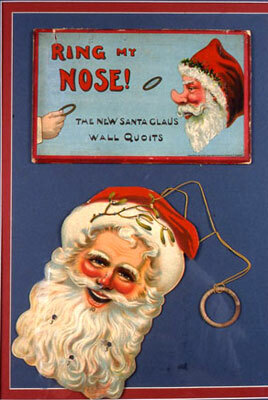 This ring-toss game is part of Dolph Gotelli’s collection of Santa Claus ephemera. Gotelli: I have primarily early greeting cards. These came out before postcards, which are very popular with collectors today. Postcards have pretty much stayed collectible whereas a lot of the other Christmas stuff has been dropped. There are not a lot of people collecting it right now. Through the years, I’ve noticed some things get very hot and everyone wants them, and then they drop off and something else picks up. Like teddy bears—they are no longer the major collectible items they were 20 years ago. I like the pop-up cards. You would open them up and there would be scenes like a Santa Claus coming out of a forest, all on different layers like in a pop-up book. This is what I mostly hunt for. They’re hard to find because paper is very fragile, and through the years the layers would break off. Every time I show one in a museum, little edges come off because they are so old. I also collect Christmas-related toy pieces that are made of paper, like little stand-up Santa Clauses. They were mostly produced by Raphael Tuck, who was a major manufacturer of wonderful paper toys. 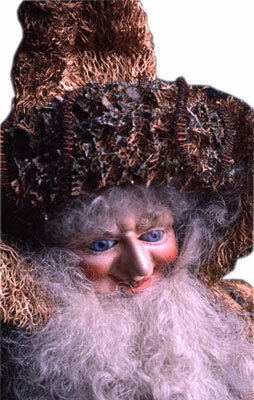 His company made jumping jacks out of paper with Santa Claus imagery and dressed animals—they were called marionettes. Chromolithography was the earliest form of printing. It was the best quality, with beautiful colors. It was used for paper favors that were put on tables, like little place cards with an image on them or cards that had been diecut into shapes. Many diecuts were designed with tinsel decorations to hang on the tree. There were paper garlands that were also put on the tree that said “Happy Christmas,” with letters made in the shape of holly, all diecut. Another thing I collect are diecut paper ornaments with images of Santa Claus, angels, snow, children dressed in snow costumes, etc. They look like little toys. There were diecut men and women dressed in colored paper and various kinds of fabric that were designed to be hung on the Christmas tree. So there are all kinds of paper-related items in a whole range of categories. I’m probably forgetting some others, but these are the main ones. Collectors Weekly: Is that all from the Victorian era? Gotelli: Yes, most of it. Some of it went through the teens up to the 1920s. Paper ornaments were made in the ’20s and ’30s. But yes, most are from the Victorian era, and I usually only collect from that period. At some point you have to draw the line because there’s only so much you can collect. You can’t do it all. Less easy to find are the window-display pieces that were put in store windows to advertise the diecuts, but I have many of those. They were over-scale versions of the small ones that you could buy inside the store. They’re about 33 inches tall. And then they also made paper window displays that actually moved, like the paper Santa Claus doll. His head and his eyeballs would move back and forth. These are called trade stimulators, and they were put in the windows of general stores, department stores, wherever Christmas stuff was sold, to lure people into the stores. A lot of people collect Christmas ads, point-of-purchase designs, ads with Santa Claus themes. So this is another area of Christmas ephemera that’s also collectible. That’s actually an important one. And a lot of advertising collectors like those pieces, too. All these collections overlap. Collectors Weekly: How do adults react to your displays? One of Dolph Gotelli’s popular Christmas tree displays. Gotelli: It’s wonderful. My exhibitions pull in all ages. People my age or older come to these exhibits with their grandchildren, or parents bring their children. They tell the stories and there’s a great sense of nostalgia when you see generations looking at the exhibits. I’m very much into rituals and celebrations and wanting to keep all of this going. A lot of people go back to the exhibitions many times, and bring new people. I think we need that in our society right now. I think we’re going through a difficult time, and fantasy is important. Now more than ever, we really need this kind of imagery, so I’m hoping that a lot of people will come this year. I think it’s a way of just getting back to childhood. People ask me all the time, “Why don’t you take all these wonderful toys and animate them?” Well, that’s completely against my philosophy, because I believe that each individual, whether it’s an adult or a child, should imagine what’s happening in the scenario. Using our imagination is missing today. The technological toys are doing everything for the child, so there’s no opportunity for them to make links using their imagination. They sit in front of their screens, watching videos and movies and playing video games. Even the toys are electronic, most of them. I call them hard toys. There are very few soft toys left. Every time I talk to a group, I ask how many people grew up with teddy bears. My UC Davis students were 18 and older, and it was amazing how many fondly remembered having a soft toy as a child. I have a lot of friends who don’t allow their children to watch regular television and limit their games, but they are in the minority. The majority of children now are used to seeing a lot of imagery. They don’t have to imagine what the story is going to be. It’s presented to them. So I don’t want my exhibits to be animated because that’s the most boring thing in the world. You go to the mall and you see this elf moving his arm back and forth. That’s it; it’s over. But if you can look at something within a scenario, you can imagine what the story is or make up your own. That’s what I do, and that’s why I intentionally use a lot of detail in my work. This one room, for example, is 36 inches wide and four feet high and maybe 35 inches deep, and it might have 300 or 400 little objects in it. There are little things that I put into it that I want people to look for and find. I want people to spend time looking closely at these vignettes. Collectors Weekly: When is your next exhibit? Gotelli: The show at the Folsom History Museum runs from November 21, 2009, through February 7, 2010, and there will be 30 or more vignettes. Folsom, California is in an early gold-rush area that’s now a suburb of Sacramento. There’s a historic street with buildings from the gold rush, and the history museum is on this street. So it’s a perfect venue for me because I like to work in historic areas. It’s fun. Collectors Weekly: What advice do you have for someone who is just starting to collect antique Christmas items? Detail from one of Dolph Gotelli’s Christmas scenarios. Gotelli: You need to be very wealthy if you want to start collecting today. It’s very difficult for young collectors. People want to buy the best of the best and you really have to have money because this stuff is real art. There are some major auction houses that deal primarily with Christmas items—if not for them, you probably wouldn’t find certain items. There are very few young people collecting. I think that younger people today, Generation X, are not interested in antiques. They’re more interested in technology. I think it’s a real diminishing field for collectors. But if you were going to start out, you could try to find some bargains. You have to be very cautious today because a lot of stuff is being replicated, and it’s very hard to tell the difference unless you’re a seasoned collector. I have friends who have bought Santa Clauses that were supposed to be from the turn of the century, and they turned out to have been made yesterday in Germany. If you’re going to pay $1,500 for a Santa Claus, you want it to be what it’s supposed to be and not a reproduction. So you really have to be cautious and educated if you’re going to get into some of these fields. It’s a sad thing to say. Maybe that’s why we don’t have a lot of new people coming up. It’s not easy to find stuff that’s really old. You can still go to flea markets and find newer things, so you still can collect Christmas, like ornaments and figures that were made in the ’40s, ’50s, and beyond. And you never know when a surprise antique Christmas ornament might appear. spirit and well being to imagine the impossible. Without imagination, we would not have rocketed to the moon. Imagine what the future can hold if the human spirit is left to soar perhaps the elimination of war! What a wonderful article/interview. I’ve learned much more about Dolph Gotelli, his accomplishments, and his fun and varied interests. I too collect antique Christmas, and Dolph is an inspiration! Thank you for sharing such a fantastic article! Very informative. 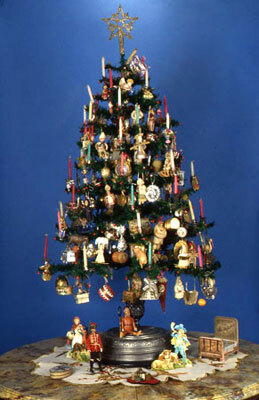 It is amazing how many of us “crazy Christmas collectors” become addicted while decorating our family tree as children. I know I did. I would love to see Dolph’s entire collection. These great photos leave me wanting more! I agree with Debbie Knight, “Dolph is an inspiration!” Thank You! What an inspiration Dolph is to all of us “Christmas collectors”. He co-chaired our National Golden Glow convention in Sacramento in Aug. and it was one of the most FABULOUS conventions. Dolph had a museum room with just his collection of early, Victorian Christmas which was the most spectacular anyone has ever seen. Thank you Dolph for your honesty about how most children celebrate Christmas today. They are missing so much and will never have the imagination of the true Christmas. Thank You Dolph for all you do to inspire “the imagination” in all of us. I loved reading your article. I’m wondering if you have any information on vintage, made in Japan, felt elfs and other small cloth figures. I recently found a box of them. Some have plastic faces, some have faces that are painted or printed onto a canvas-like face. I’d like to know more – general age, history and value. Thank you again Dolph for all the information and shared opinions that so many of us have witnessed. Here’s to Christmas! Interesting and informative article. Thanks. I’m so thrilled to have stumbled across this article! I was searching the web for Podesta Baldocchi because my mother and I purchased Xmas ornaments there in the 1960’s. I want to give my daughters a little bit the history behind them. My mother has passed away now, so I don’t have that wonderful feeling of shared memories. But reading this story was just about as good! Thanks!!! I have the books (several by different publishers) of “The Night Before Christmas” (the kind you could buy in grocery stores) and read them NUMEROUS times to my kids (along with other Christmas related storybooks) weeks before Christmas. They actually loved that I read to them and I LOVED doing it; it was a tradition that I started with my 1st child when he was about one year old and continued until he (and his sister who was born 3 years later) turned about twelve years old, sad to say. Is there such a thing as an early sugar christmas ornament? “ ” I wanted to see what it would be like to do the painting without my brother.